Arnuv Raina (VIII F) and Sparsh Jandial (X F) of Heritage School brought laurels to the institution by winning the 1st Runner Up Trophy in PCRA ,Saksham – 2017, Zonal level Quiz Competition held at New Delhi on 30th Jan. 2018. The Quiz Competition was organised by Petroleum Conservation Research Association (PCRA) Govt. of India, in which 9 teams across the northern region of the country participated. Earlier Arnuv and Sparsh qualified at School Level, District Level and State Level online competition to participate in the Zonal Level championship for which over 2 lakh students from 31,000 schools across the country had participated and only 9 teams qualified for the Zonal Level Round. The recording of the Zonal level Competition will be telecast on National television Doordarshan in the month of February. 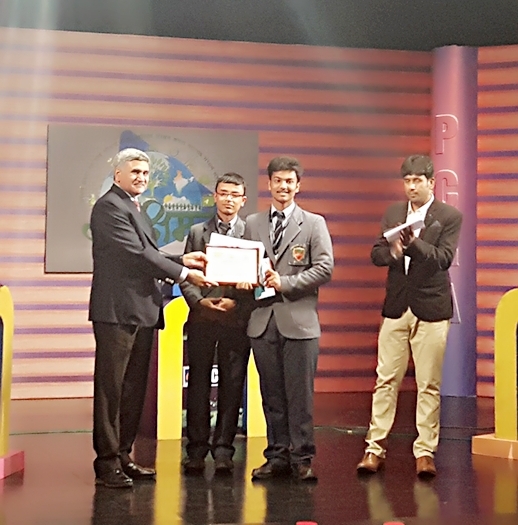 The brilliant quizzers Arnuv and Sparsh were felicitated in the school assembly by the Principal Mr. Jagadish Singh Dhami, who lauded them and their mentor Mr. Vikas Sawhney on their remarkable success.